Continuing its commitment to developing and delivering industry-leading storage technologies, IBM is introducing the IBM Real-time Compression Appliances for NAS, an innovative new storage offering that delivers essential storage efficiency technologies, combined with exceptional ease of use and performance. In an era when the amount of information, particularly in unstructured files, is exploding, but budgets for storing that information are stagnant, IBM Real-time Compression technology offers a powerful tool for better information management, protection, and access. IBM Real-time Compression can help slow the growth of storage acquisition, reducing storage costs while simplifying both operations and management. It also enables organizations to keep more data available for use rather than storing it offsite or on harder-to-access tape, so they can support improved analytics and decision making. IBM Real-time Compression Appliances provide on-line storage optimization through real-time data compression, delivering dramatic cost reduction without performance degradation. 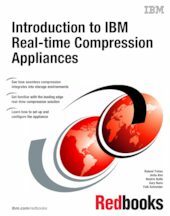 This IBM® Redbooks® publication is an easy-to-follow guide that describes how to design solutions successfully using IBM Real-time Compression Appliances (IBM RTCAs). It provides practical installation examples, ease of use, remote management, high availability, and administration techniques. Furthermore, it explains best practices for RTCA solution design, application integration, and practical RTCA use cases.